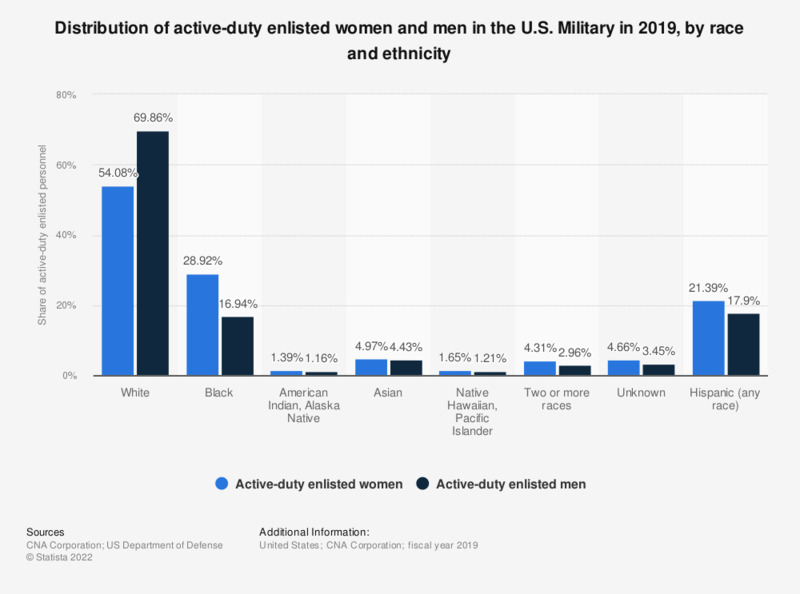 This statistic shows the distribution of active-duty enlisted women and men in the U.S. Military in FY 2017 by race and ethnicity. In FY 2017, 19.57 percent of active-duty enlisted women were of Hispanic origin. The total number of active duty military personnel in 2017 amounted to 1.29 million people. The United States are known around the world for the diversity of its population. The Census recognizes six different racial and ethnic categories: White American, Native American and Alaska Native, Asian American, Black or African American, Native Hawaiian and Other Pacific Islander. People of Hispanic or Latino origin are classified as a racially diverse ethnicity. The largest part of the population, about 61.7 percent, is composed of White Americans. The largest minority in the country are Hispanics with a share of 17.7 percent of the population, followed by Black or African Americans with 12.4 percent. However, life in the United States seems to be rather different depending on the race or ethnicity that you belong to. For instance: In 2017, American Indian and Alaska Native had the highest birth rate of 62 per 1,000 women, while 1,000 White alone, non Hispanic women gave birth to 50 children. The Black population living in the United States has the highest poverty rate with of all Census races and ethnicities in the United States. About 21.2 percent of the Black population was living with an income lower than the 2017 poverty threshold. The White, non-Hispanic population has the smallest poverty rate in the United States, with about 8.7 percent living in poverty. The median annual family income in the United States in 2017 earned by Black families was about 50,870 U.S. dollars, while the average family income earned by the Asian population was about 92,784 U.S. dollars. This is more than 15,000 U.S. dollars higher than the U.S. average family income, which was 75,938 U.S. dollars. Hispanics can be of any race. All racial groups represent their Hispanic and non Hispanic components combined. *Unlike the Navy, Marine Corps and Air Force, the Army does not report data on the number of active personnel in the two or more category.